Banff has been on my must-visit list for a while now, and this summer mountain wedding shoot will be sure to add it to yours too! 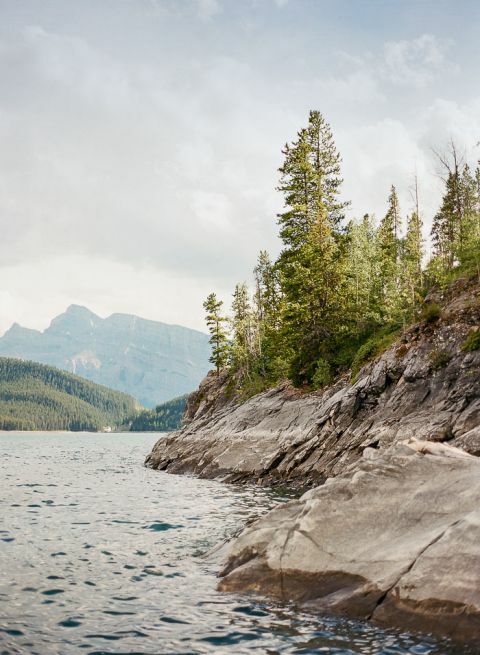 Emily Katharine Photography and JoyFoley Weddings wanted to showcase the natural beauty of Lake Minnewanka along with a couple in love. Summer greenery, soft peach flowers, and a breathtaking mountain vista will give you a dose of wanderlust to start your year off right! 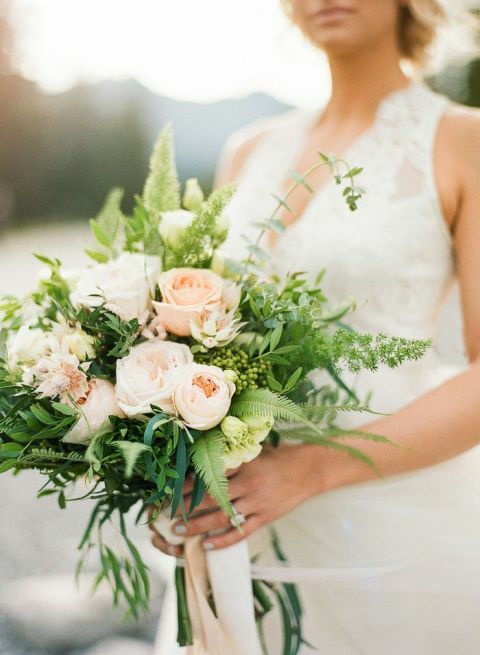 Fleurish Flower Shop channeled the beauty of a mountain summer into the bride’s bouquet and flower crown of fresh greenery and soft peach blooms. Ferns and eucalyptus created an organic canvas for delicate roses and blushing bride proteas, creating the perfect pastel arrangements. 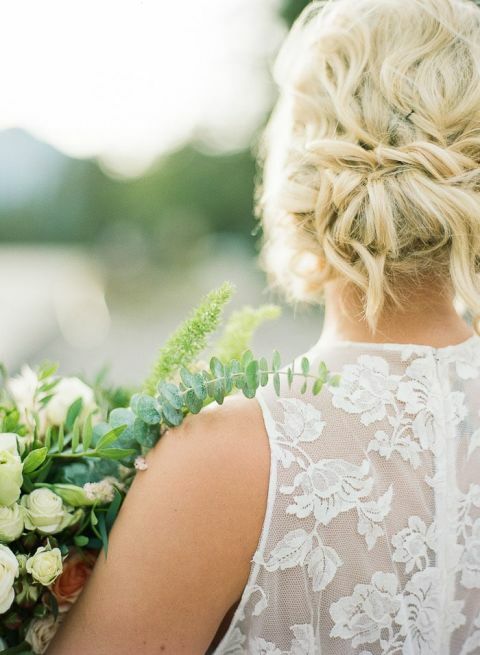 The soft lines perfectly suited her lace and tulle Elizabeth Dye gown from The Bridal Boutique Calgary with its deep v- neckline and sheer lace back. The floating layers of the tulle skirt added whimsy and romance to the staggering natural location that stole the show in ever photo. To contrast, JoyFoley dressed the groom in classic black with a subtle windowpane check suit and skinny tie. 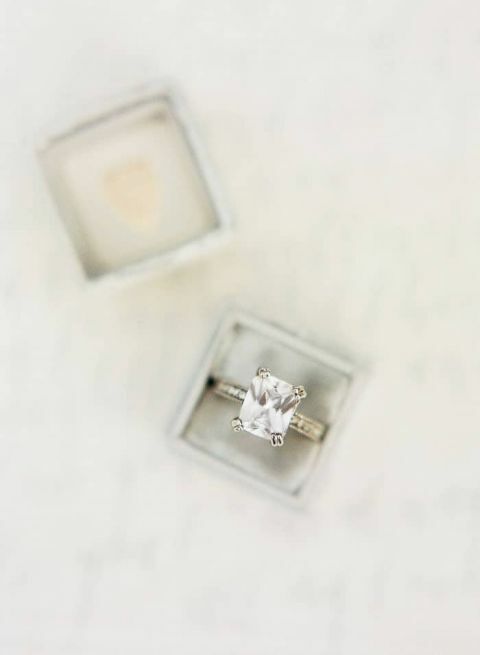 The simple and timeless look added to the effortless outdoorsy style of the shoot. After exchanging beautifully calligraphed vows on the shore of the lake, this gorgeous real couple toasted their union with a bottle of rosé. A simple one layer naked cake was the ideal dessert for the intimate feel of the destination shoot, with fresh summer fruits and flowers adorning the rustic display. The crowning touch was an antique rowboat decked in garlands of summer greenery and flowers to sweep away the bride and groom!